The current challenge of wearables is to make them desirable, to make people want, to make people relate to wearables, connect to it. Emotional Wearables are the next frontier in smart clothing, and this project precisely emphasizes on smart clothing for mothers, which also enables them to bond with their baby. This is a classroom project from my final semester, it is a combination of wearable design and hi-fashion apparel for pregnant women. It is a LeD garment that glows whenever the baby kicks in the mother’s womb. It is to celebrate the magical experience of a life growing inside you. 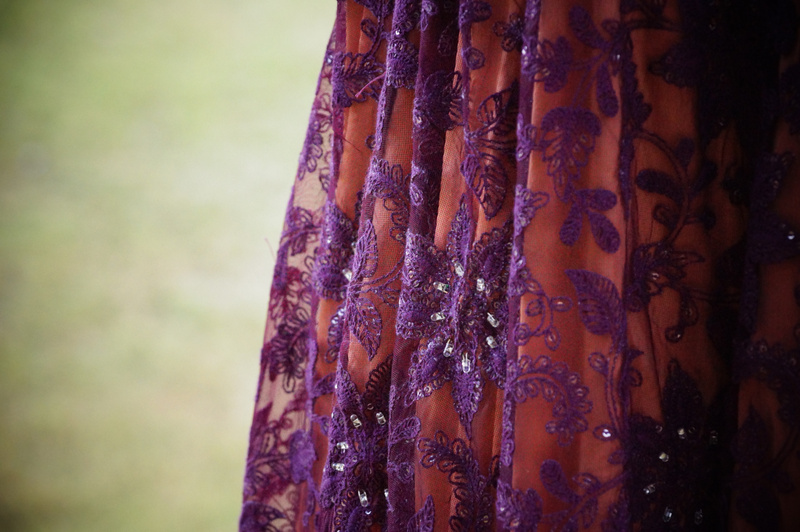 It is an expressive interactive evening wear for the modern day women, to celebrate her motherhood. 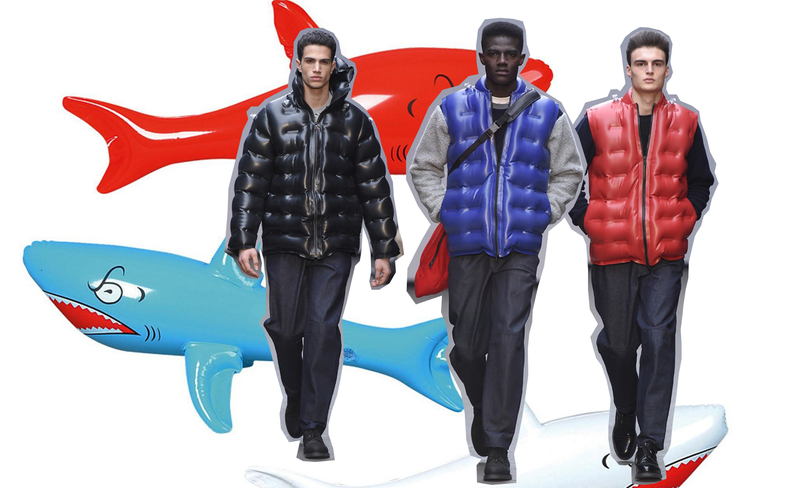 Christopher Raeburn’s latest collection “Raft” includes primary-colored inflatable latex puffer jackets that are far sexier than any life preserver. The collection with its darker “survival” theme is playfully juxtaposed with a novel use of colorful inflatable latex, essentially creating designer floaties for adults. So why do I write about this on a wearable tech blog? It’s important to see how designers reconsider materials in order to create something that looks fresh and at the same time familiar. 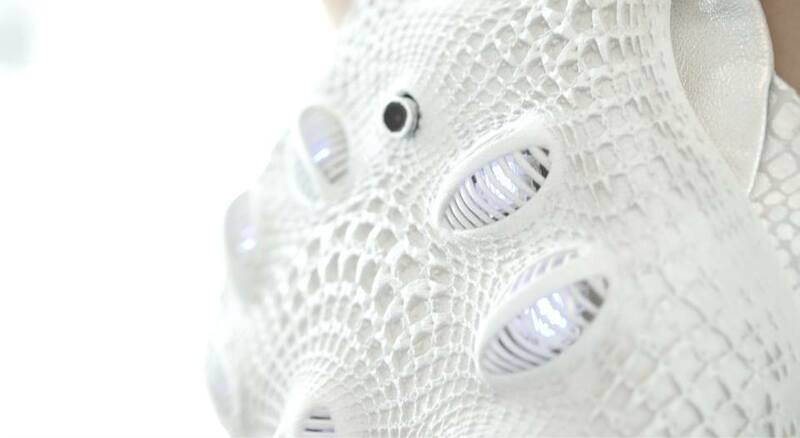 Created by Dutch FashionTech Designer Anouk Wipprecht, modeled in collaboration with Italian Architect Niccolo Casas, 3D printed at Materialise, and the awaited Intel Edison (announced at this years CES in Las Vegas) was incorporated into this garment to make it the smartest yet! 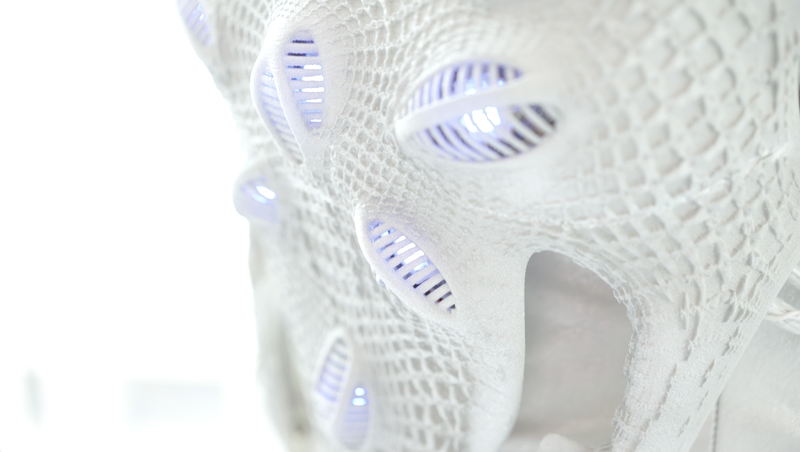 Anouk’s work tries to imagine how new high tech materials combined with smart sensors and actuators can impact the ways we connect, communicate and relate to one another. She believes technology will transform from the role of a ‘device’ towards functioning more as an integrated medium. As ‘wearable electronics’ like smart watches and trackers have fully arrived and it’s time to look at what more fashion has to offer, and the field of smart textiles and interactive garments have barely been explored. While there starts to arise more requests for ‘intelligent fashion’ from the consumer market, as noticed by the designer. The Synapse Dress is an experiment between the wearer’s internal and external state, aimed at being ‘interactive fashion’ gone smart. this dress functions as an sensing garment, an dress based on bio-signals acting on the wearers behalf due to embedded sensors and actuators. Like Anouk’s other works, her over the top high-tech meets fashion style suits to a broad audience, to impress and ignite. 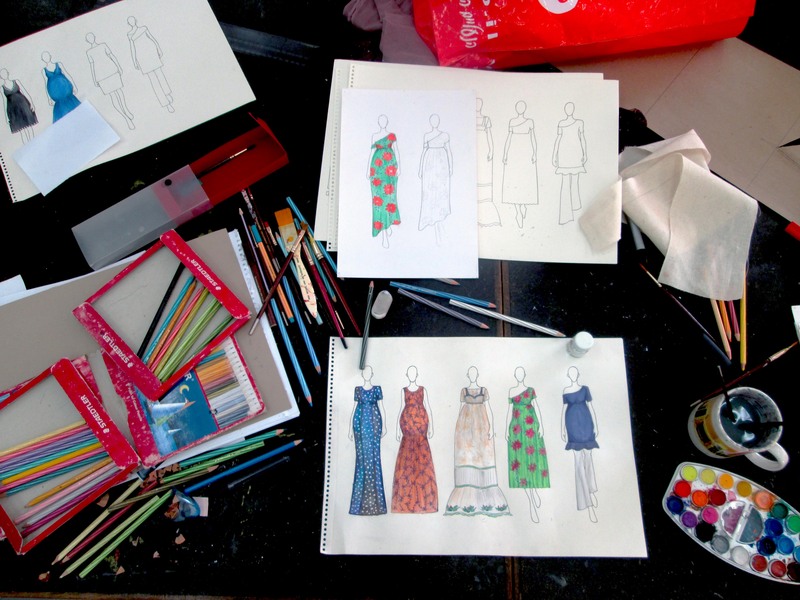 But – the designer says – she also sees a very app-liable approach to the concept. As the dress logs your mood, and senses you far beyond one set of bio-signals only, the dress can become a little ecosystem which monitors your attitude, integrating the data from many sensors to put interaction back in the hands of the wearer, while co-evolving with the system around your body. During Intel Development Forum 2014 (#IDF14) several different modes of interactions were explored on the Intel Edison micro-controller. 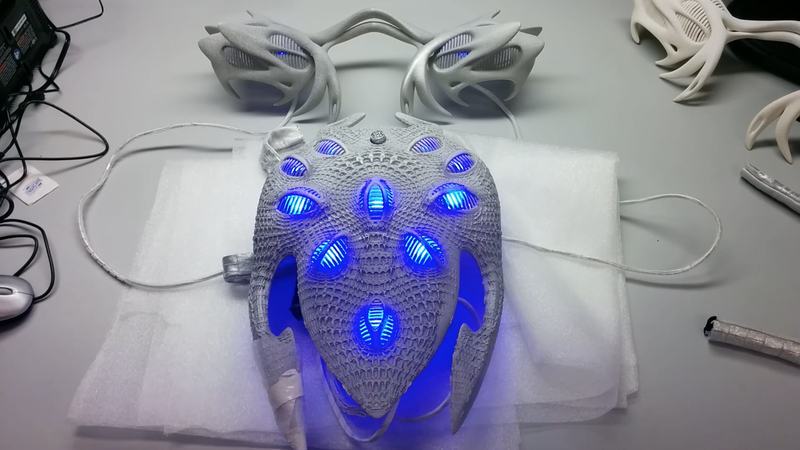 The wearer was able to control the bright LEDs with manual control, remotely, with her mind, heart rate, and even proximity. She was able to capture photos and video during states of heightened concentration. These experiments with the participants and the data gathered inform a new series of connected and body sensing garments in the designers already impressive collection. The dress headpiece is fitted with a sensor that tracks the wearers attention level. The Synapse Dress is aware of the wears heart rate via bluetooth. A wifi camera is controlled from the Edison micro controller to collect data about the wearers personal space when they are feeling anxious or in (dis)stress. An on-board web app collects and collate this data for review should the wearer want to know more about their emotional triggers, functioning as a ‘mood map’ of the wearer’s mind, and day. The Synapse Dress is controlled from voice commands should the wearer want to express some of this sensor data or blast a person with 140W of blinding blue light if they come too close. These involuntary responds on the wearers behalf make for an interesting conversation about comfort while treasuring her personal space. Unlocking the potential of body sensors, voice control, and intelligence within a garment gives a new view on ‘fashion design’ than we would have thought of in at the start of this century. On board intelligence that ‘lives’ with us while it’s nurturing our mood and protecting our personal space. These capabilities open up a new world for interaction designers to research possibilities and design products around the way people act without their devices. 2015 could be the year that things all come together to bring innovative feeling garments to the market. What immerse experience are you aiming for with Synapse? With Synapse I did a first attempt to embed Intel Edison into a sensing garments, a dress that electronically relates to her mood and attitude as an window to her ‘inner self’. Focussed on the experience of the wearer and with the use of Intel Edison I try to challenge, embed and explore new kinds of sensing methods like wireless biosignals and also new outputs like an on board camera which for example – at the height of her focus, automatically capture her observations. All data can optionally be transferred wirelessly to an external display and at the end of the day she has an ‘mood board’ of her own day. On the potential to incorporate a personal emotional state into a garment: Where my former works have been more based on the expressive ‘external’ notion (a dress that covers itself in smoke as soon as you step into her personal space, or attacks you when an intruder gets too close) this dress is focused on the ‘internal’ state wearer where my system will authorize, nurture and curate (private) inner feelings aimed on self-awareness. In a social sense it might be based on identity and the conception of identity as well. With fashion being the curator of a global sense for style and identity – wearable technologies like this might be the curator of the individual and the inner self instead. A ‘smarter sister’. As a sensing garment like this can create a very personalized approach based on ‘how you feel like’, rather than ‘who you are’. What is the most significant change Intel Edison brought to your design? Working with Intel Edison allows me much broader simultaneous sensing and actuating capabilities, envisioning my dialogue with fashion that behaves (or mis-behaves) intuitively as it enabled my vision to sense, process and connect wirelessly to share and transform the raw data of bio signals in real time. The dress is a collaboration with the New Devices Group at Intel, with whom we have much more things planned. This usage of the micro controller platform board in this setting is only the start, as many more utilizations spin my head. 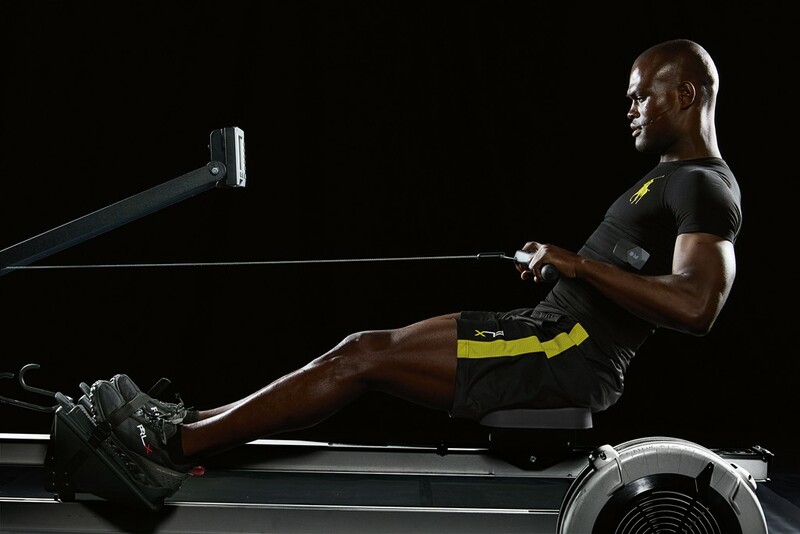 With “wearables” concept being grown every day, – how do you see it affecting consumer fashion? We came a long way but the fashion system and the technology system are still two completely different systems. This needs to collide much more in order for a new field like interactive garments and smart textiles to flourish. We are finally at a time that designers, technologists, companies and industries are talking and creating functional and admirable prototypes. Which is really great, therefore I am looking forward to the things to come. Interactive fashion will define how we ‘buy’ our clothing; an electronic dress won’t be thrown away, but will be updated and upgraded, digital manufactured and tailor-made. I think for example, buying an electronic dress will affect our attitude towards our garment, as you will flow from being a ‘wearer’ to being the ‘user’ of your new dress. How does the interactive aspect change how people think and feel about their clothing? I think with the evolution of internet and new media, which is coined at creating more digital intimacy and engagement (example, intuitive interfaces, IoT, Web 3.0 etc), people will start to ‘search’ more for an immerse connection. Established bonds that we have with technology will morph into personal and intimate connections that we have with the interfaces around us. It is for the designers to create or recreate these new interfaces that can capture data and realize, re-communicate or argument this data through digital or physical means. As the concept of wearable technologies move from simple tracking devices it may well evolves to represent a more tight alliance between the body and technology significantly changing how we interface and interact with the world around us. I saw two things when I started research into technological connectivity ten years ago; from an technologists point of view technology started to crawl closer to the skin, and from an fashion designer’s mindset – I noticed that fashion could be one of the most intimate interfaces we have around our bodies. At this point all the garments I like to create are a a bit dramatized demonstration of what certain interactions can convey, to provoke and inspire – but in broader view they relate to how I imagine new high-tech materials and on body interactions can impact the ways we connect, communicate and relate to one another. In my observation, technology will transform from the role of a ‘device’ towards functioning as an integrated medium. With fashion being the only truly ‘wearable’ – spread all over our bodies and increasingly integrated abilities to sense and compute, we can start to redefine how our future wardrobe will look like. I try to evoke and stir this discussion with my work. Dresses as communication medium: functioning as interface or ‘medium’ between wearers body/skin and surroundings; a privilege to wear or a necessity very soon? Get in line, as this designer could release some designs to the market in a near future, if only to supply us with otherworldliness. 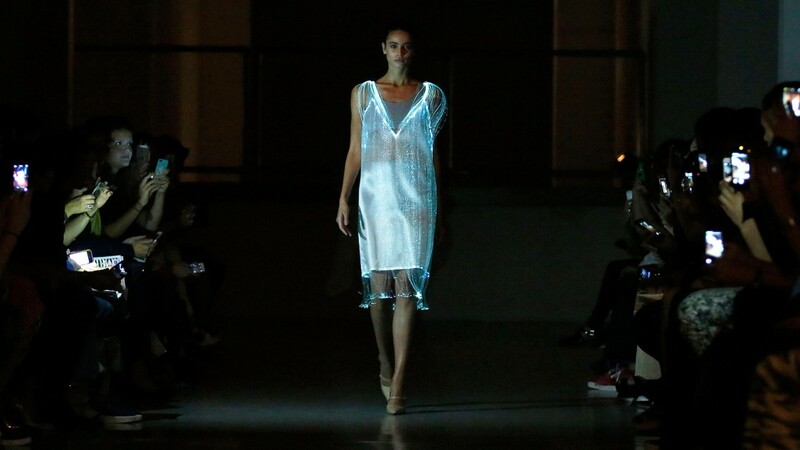 Richard Nicoll sent a lovely, illuminated garment down the runway at London Fashion Week. 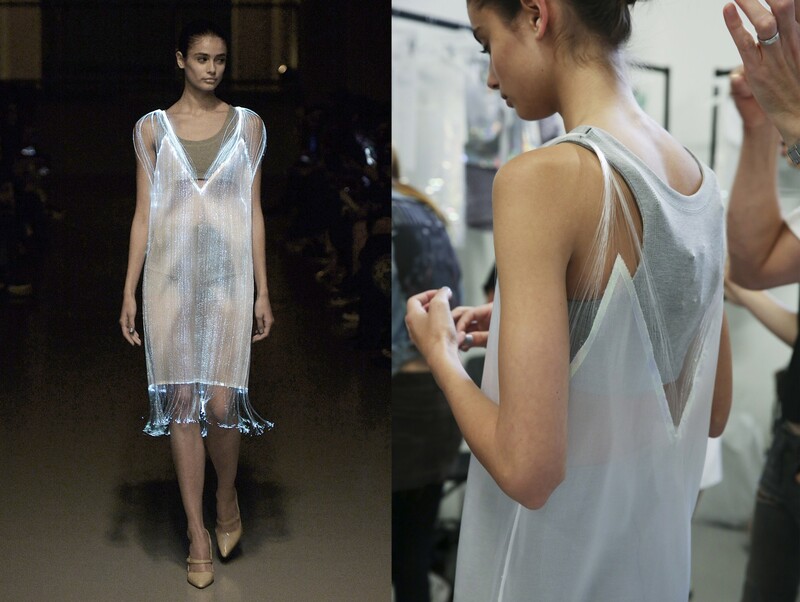 The garment appears to be made from Lumigram fiber optic fabric. 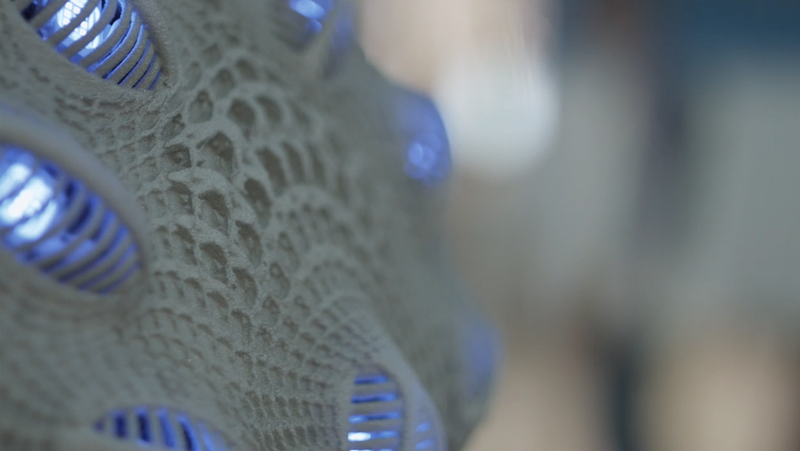 Although we’ve seen plenty of examples of Lumigram’s fiber optic fabric in use, Nicoll nailed the fluidity of the design (reminds me of jellyfish) that the fiber optic textile lends itself too. The project was done in collaboration with Studio XO and Disney. Below are some photos of Opening Ceremonies debut of MICA at New York Fashion Week. Fashion is the tech industries latest muse. Check out the latest announcements of future collaborations between tech giants and fashions brands. 1. 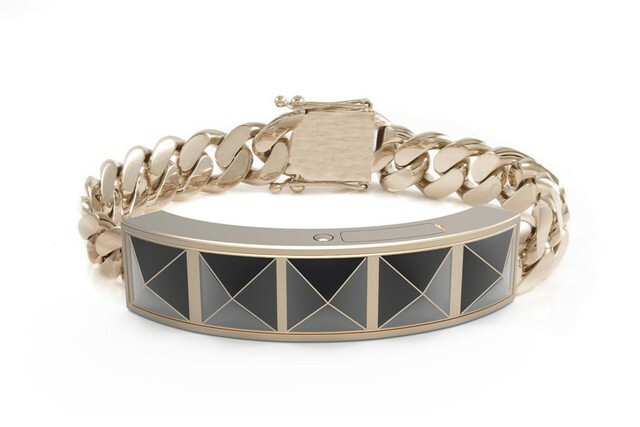 Intel just announced a new collaboration with fashion brand Fossil. 2. Guess recently announced a new collaboration with smartwatch maker Martian. 3. 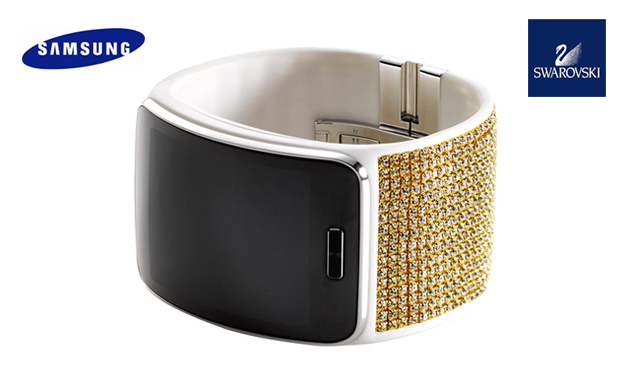 Samsung collaborates with Swarovski to bling out its smartwatch. 4. Michael Bastian collaborates with HP for new smart watch design. 5. Swatch is bringing activity tracking to its watches. 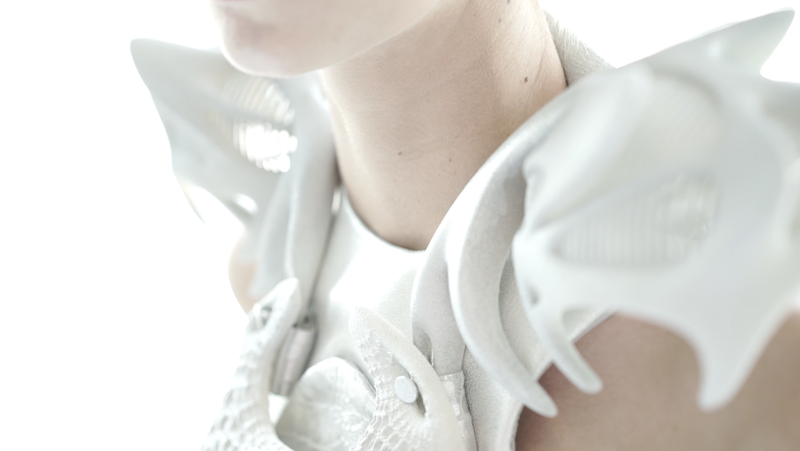 Metamorphosis is an experimental wearable that responds to the wearer’s alcohol consumption. Designed with pleated origami sleeves that expand and contract, the wearable technology garment reflects the drinker’s confidence levels as she consumes alcohol. The more alcohol consumed, the higher the sleeves. It naturally also expresses how quickly someone has consumed alcohol and their intoxication levels. The garment is witty commentary on Korean drinking culture and the customary obligation to drink when invited. 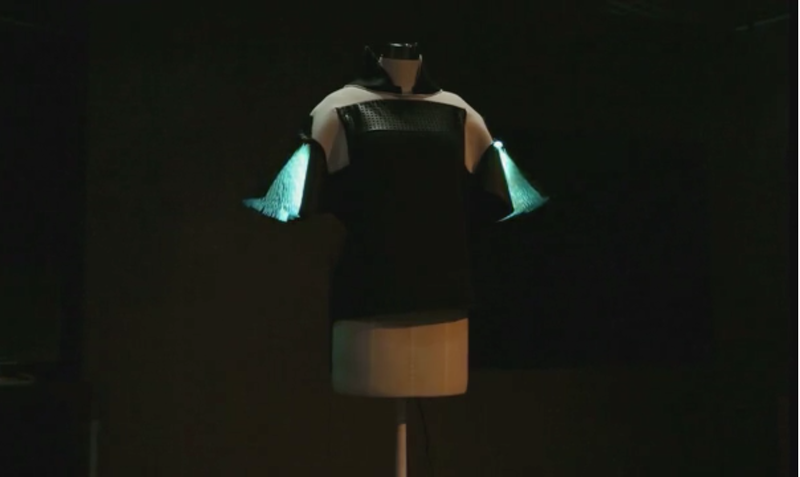 The garment was developed by a team of artists during a 5 day wearable hackathon in Seoul. More details regarding the wearable can be found here. Just before the start of New York Fashion Week, Intel reveals images of MICA, an acronym for “My Intelligent Communication Accessory,” their much anticipated collaboration with fashion house Opening Ceremony. 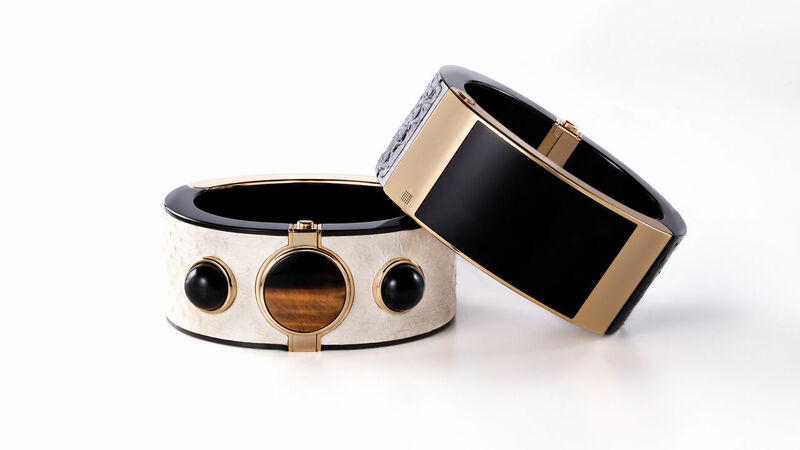 Unlike most wearable tech jewelry that falls into the fitness category, MICA is a lifestyle accessory competing with others like Ringly, Kovert, BlueJewlez, Elemoon and Rebecca Minkoff’s soon to debut smart baubles. MICA’s main functionality is that it handles your communication and social feeds acting like as alert mechanism. 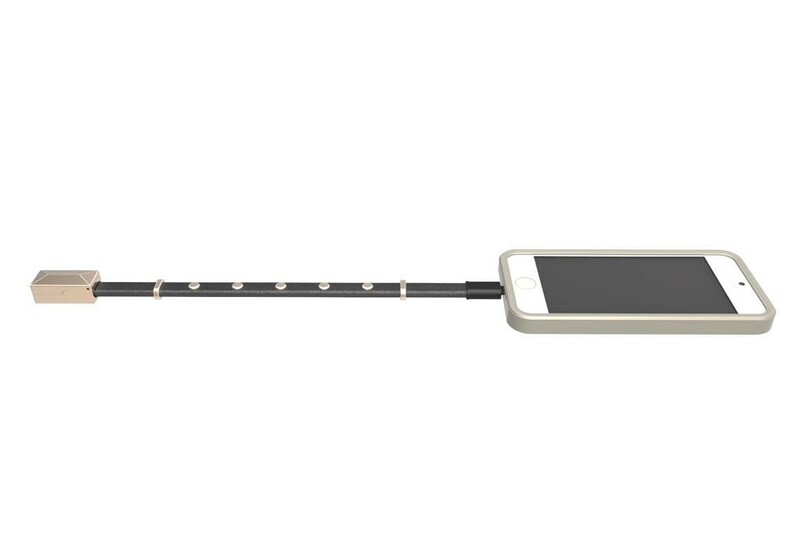 The difference between MICA and its predecessors (none by the way are on the market quite yet) is that it contains its own 3G cellular radio so it will not need to be tethered to your phone. MICAs main advantage is that it has an aesthetic edge compared to Ringly or Minkoff’s wearable jewelry. Made from snakeskin and embedded with pearls and stones, MICA will certainly appeal to the fashion crowd. My favorite design and usability feature is the curved touch screen display which is located on the inside of the wrist, allowing private messages to be displayed more discreetly. 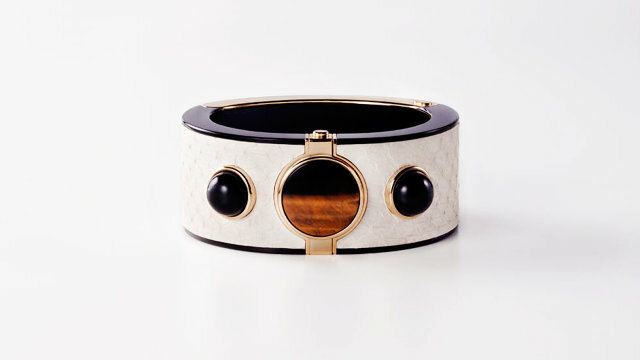 The bracelet will be available at Barneys and Opening Ceremony for the holiday season. The price tag is sure to be high which a luxury brand like Opening Ceremony can pull off. As Fashion Week approaches, I anticipate seeing a lot of new wearable tech pieces hitting the runway. 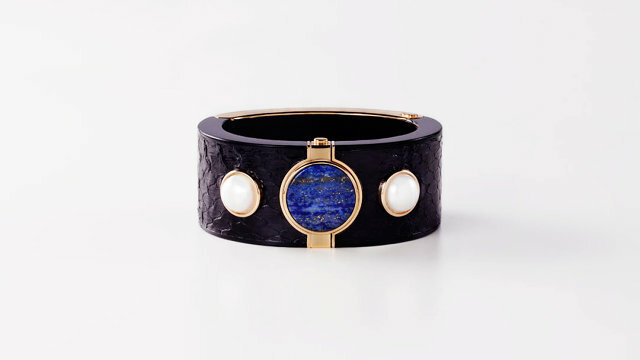 Fashion companies have embraced wearable tech accessories transforming them into stylish jewelry pieces to fit the always connected and the on the go lifestyle of 20- and 30-somethings. Most of the accessories are low hanging fruit — mobile chargers or alert notification systems for their mobile devices — but the willingness for both the tech and fashion worlds to collaborate promises a bright and fashionable future for wearables. 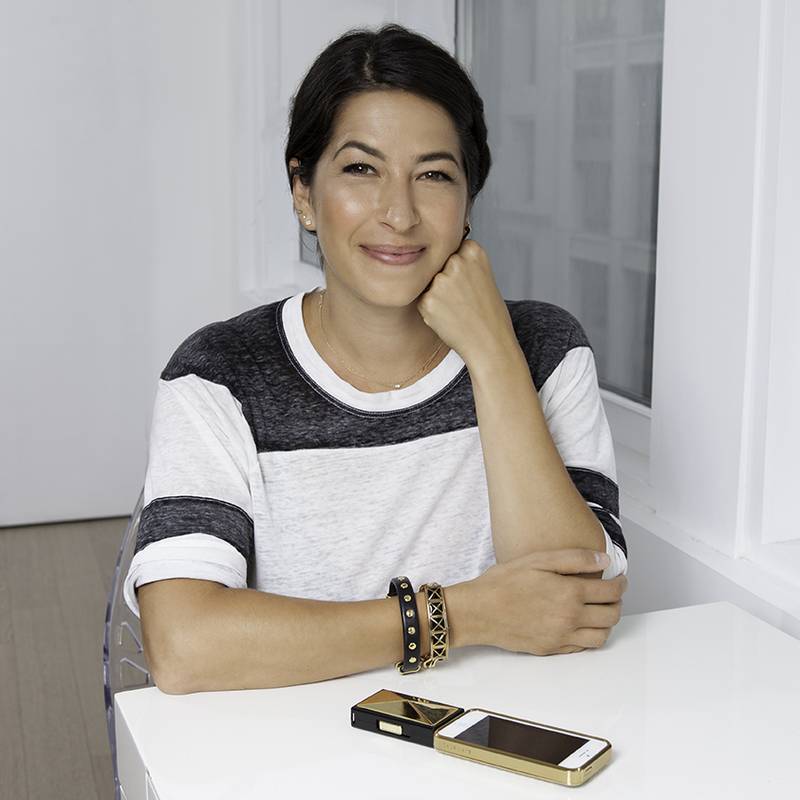 Rebbeca Minkoff is the latest designer to offer stylish accessories to juice your mobile phone or to offer you alerts of incoming call. The accessories will run between $60 – $120 — affordable considering Ringly starts at $195. Cute Circuit will be showing their second collection tomorrow on September 4rth at Mercedes-Benz Fashion Week. 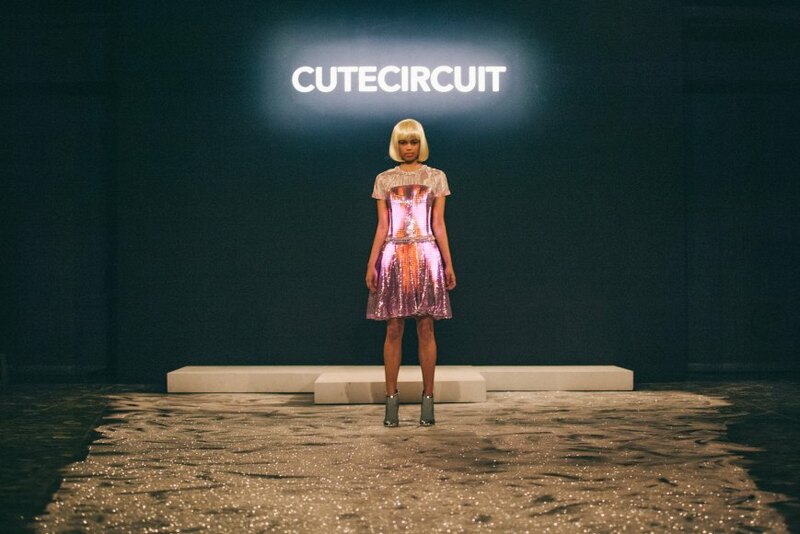 Pioneers in the space of illuminated fashion, Cute Circuit has been making gorgeous illuminated wearables for over a decade. Stay tuned for more coverage. It’s going to be an exciting month! 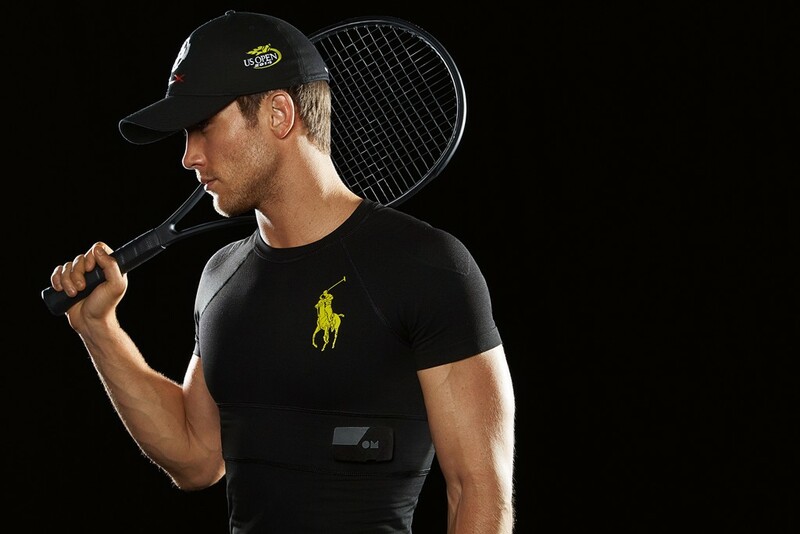 Ralph Lauren has entered the wearable tech market with the debut of Polo Tech, a smart compression shirt that reads biometric data. 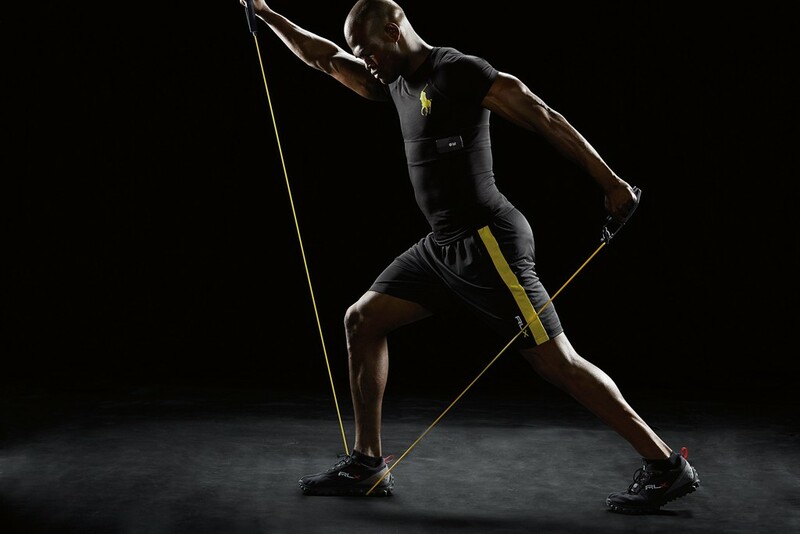 Collabortaing with OMsignal, the Polo Tech shirt contains soft sensors that read respiration and heart rate as well as an accelerometer and gyroscope to capture movement. The Polo Tech shirt will be available in the spring and offered in a variety of patterns and colors. Incorporating technology into garments is a strategic move for the Ralph Lauren brand in an attempt to make the brand more current and “thoroughly modern,” stated David Lauren, executive vice president of advertising, marketing and corporate communications at Ralp Lauren Corp.
Ralph Lauren’s move into wearables signifies a must needed shift from wearables gadgets that the current tech world is producing to etextiles — the inevitable future of wearable tech apparel.